Scientists have taken the first ever pictures of the surface of an alien Sol-like sun. The team, led by astronomers at the University of Michigan, made the observations of the relatively nearby (15 light years away) star Altair. They used four of the six telescopes at Georgia State University's Centre for High Angular Resolution Astronomy (CHARA) interferometric array on Mount Wilson, California. Astronomers already knew Altair was oddly shaped: the star is 22 per cent wider than it is tall, thanks to the speed of its rotation. At its equator it is spinning 638,000mph, roughly 60 times faster than our our sun. 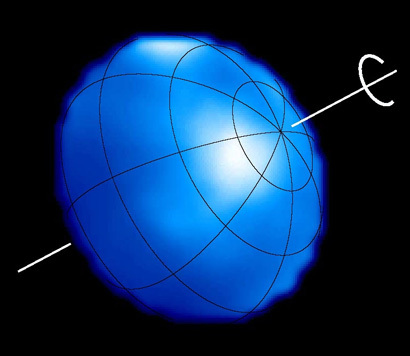 "It's really whipping around and that's why, of course, it's spread out like a twirling ball of pizza dough," said Monnier, an assistant professor of astronomy at the University of Michigan. In 1924 astronomer Hugo von Zeipel predicted that rapidly spinning stars would bulge. He also speculated that their equators would be much cooler than their poles, by virtue of the greater distance from the heat of the solar core. The new images are the first that confirm the idea, but also reveal more about this predicted variation in temperature across the surface: the bulge is much cooler than standard models had predicted. "This image can only be made with a telescope the size of a football arena. I dare say that we may never create a single telescope mirror this large, but we can do this today with interferometry (a technique to resolve an image using multiple beams)," said Monnier. The image has been made possible by recent advances in fibre optics. This allows the researchers to combine the images from each telescope in such a way as to clean up some of the distortion from the Earth's atmosphere.